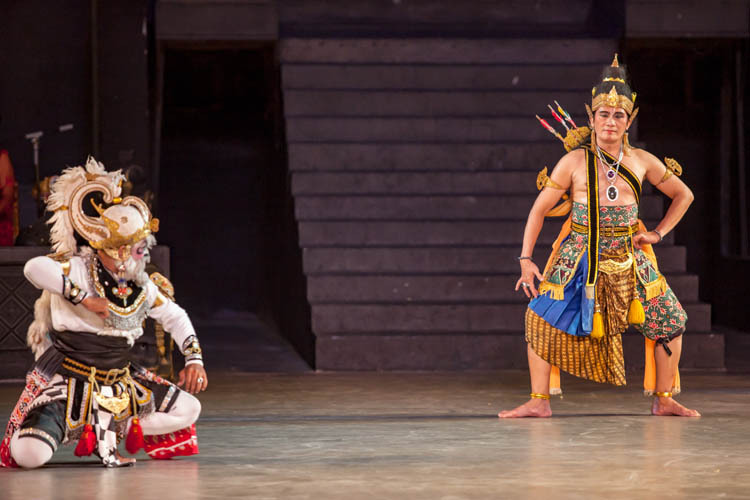 When we were in Jogjakarta back in July, we had the pleasure of (again) attending a performance of the Ramayana Ballet. 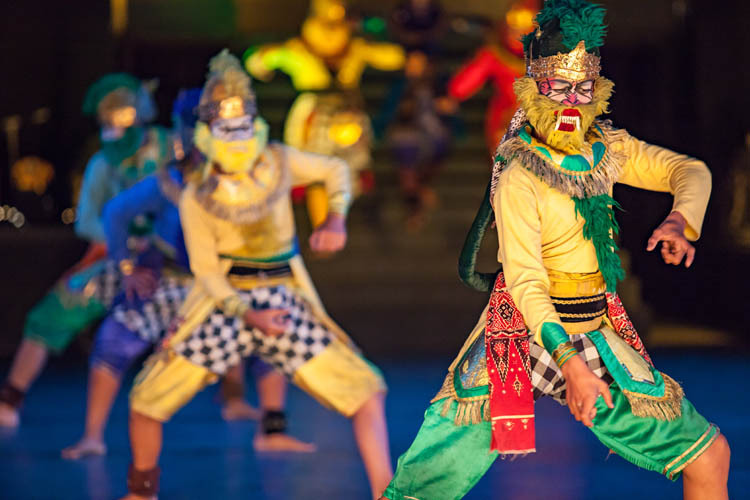 It was held in the grounds of the 9th Century Hindu temple at Prambanan, 17km east of Jogja along the road to Solo. 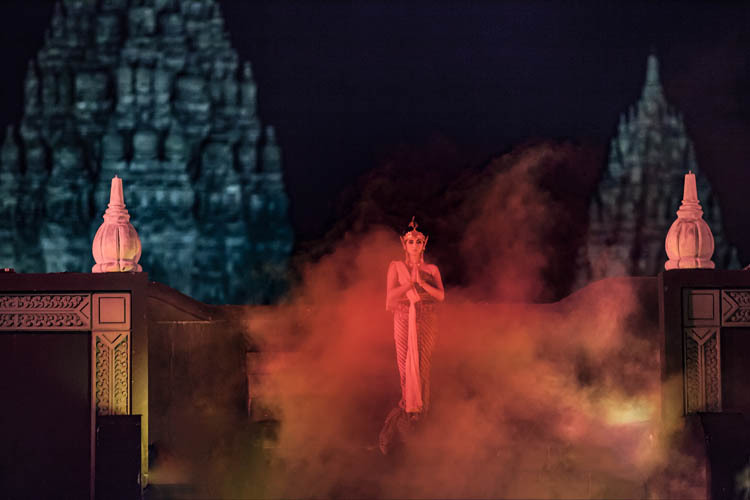 With the towering temples in the background, it was a wonderful, and wonderfully appropriate, venue for the performance of this mythic saga. Here are a few highlights. 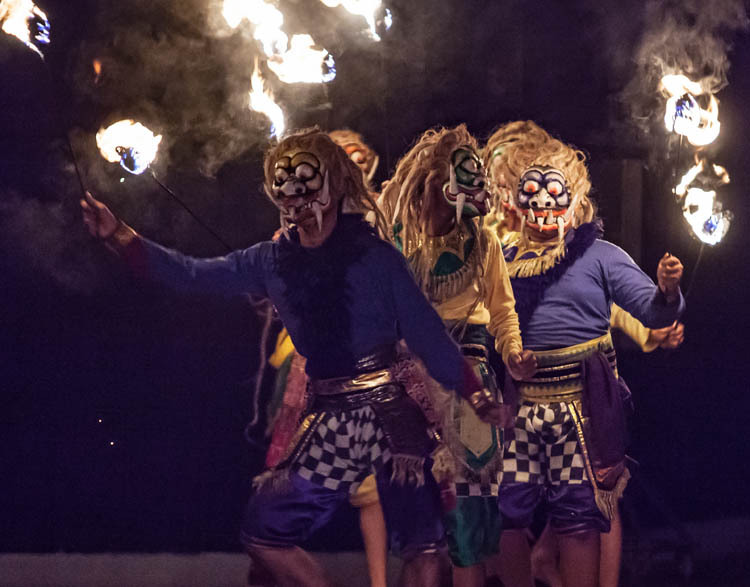 The Ramayana is, in every sense, an epic. The ‘ballet’ – which perhaps more of an opera, with equal proportions of music, dance and theatre – just includes some of the best-loved and key scenes of the massive story. 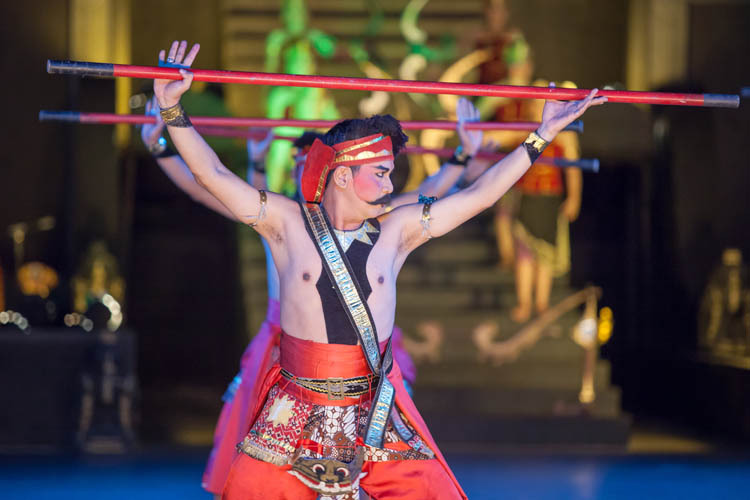 There’s pageantry, strong characters, gamelan orchestra music, martial arts and acrobatics, romance and drama. 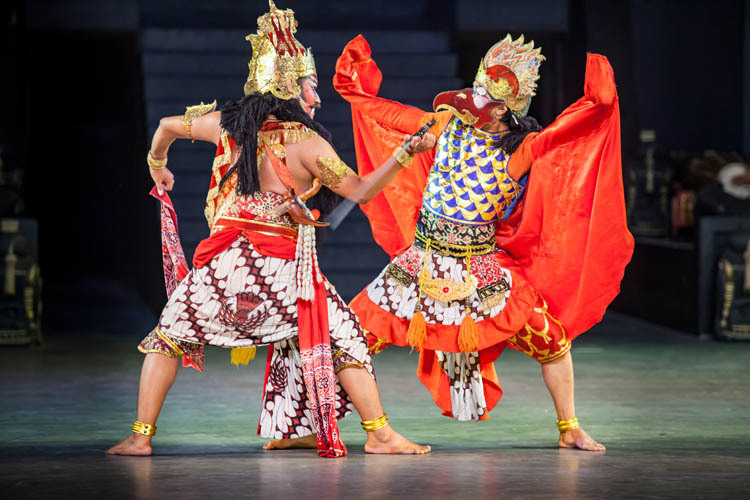 No wonder that this Hindu epic remains the most popular and well-known folk story in Muslim Java. We are introduced to the main protagonists: Rama, prince of Ayodhya, unfairly forced to live in exile in the forest. Sita, his devoted wife, and herself a princess. She joins him in exile. 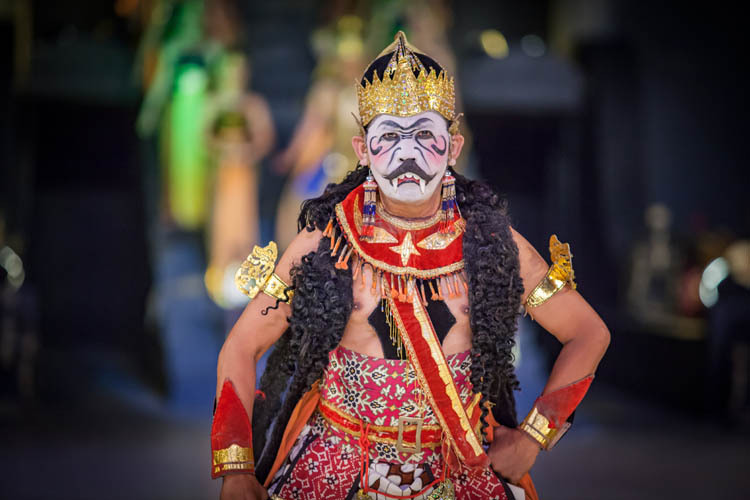 Rama’s faithful younger brother, Laksmana, who also follows Rama into the forest. The two of them are (of course) brave warriors, and rather handy shots with a bow and arrow. And of course there are is a variety of nasty adversaries for the heroes to battle, ranging all the way along the scale of evil and strength. Chief amongst the foes is the demon Rawana, King of Langka. You only need to look at him to know that he’s a nasty piece of work. And when he speaks, he roars, growls and bellows. He falls for Sita, and sets out to win her by fair means or foul. No, actually only by foul means. Rawana sends a beautiful and uncanny golden deer into the forest to entice Sita. She is enchanted by it, and she sends Rama and Laksmana off to try to catch it for her. They leave her in safety, protected inside a magical protective circle. Rawana tries to capture her, but he can’t get inside the circle. Sneaky trickster that he is, Rawana returns disguised as an elderly mendicant. 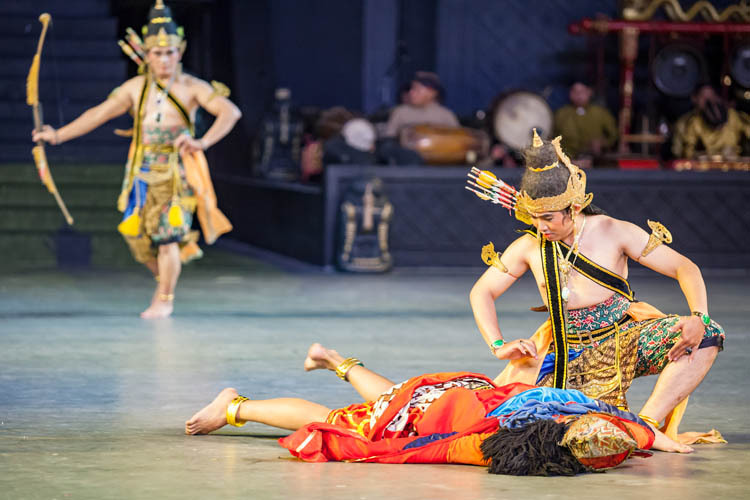 Kind-hearted Sita takes pity on him, and leaves the protection of the circle – and is of course immediately captured and spirited away to Langka by Rawana. En route to his kingdom of Langka, Rawana encounters, battles and defeats the bird-man Sampati. Before he dies, he reveals to Rama (or was it Hanuman?) that Sita has been spirited away to Langka. And so the scene is set for confrontation and battle. 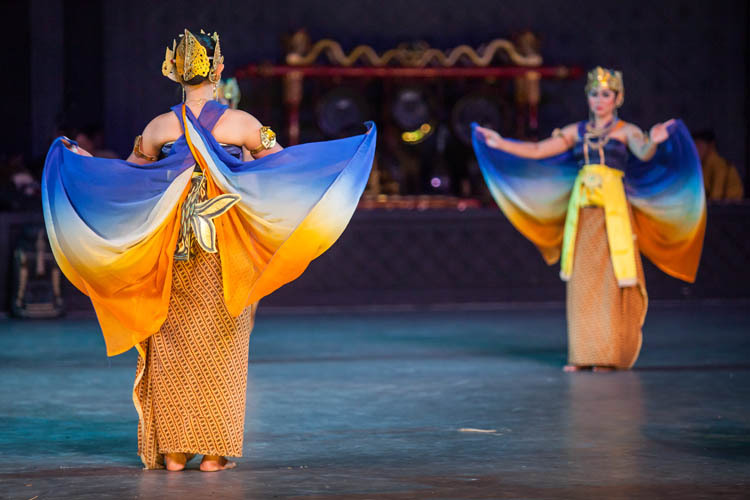 Down in Langka, the women of the royal court perform an elegant dance for the newly arrived Sita. Hanuman comes in disguise to the court of Langka, and reveals himself to Sita, proving his identity by showing her Rama’s ring. She pleads to Hanuman for Rama to come and rescue her. Hanuman’s monkey army loosens up in preparation for battle. They build a floating bridge so that Rama and the monkey army can get across to the island of Langka. 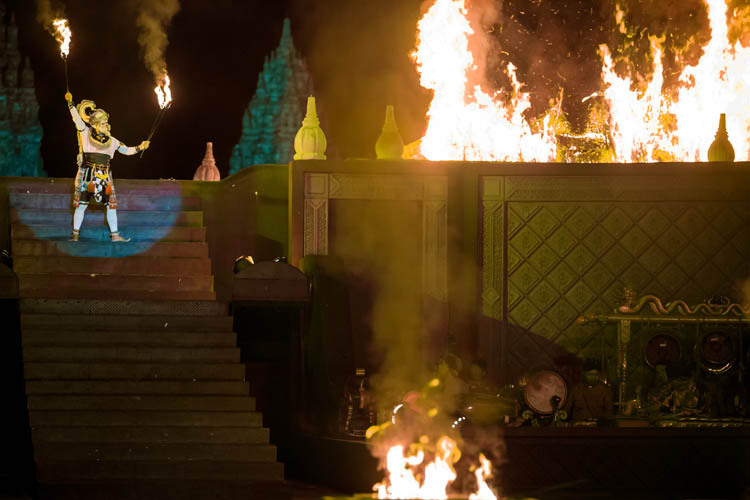 Never give flaming torches to monkeys. It’s sure to end in disaster. Hanuman returns to the court of Langka, and proceeds to set the place ablaze. 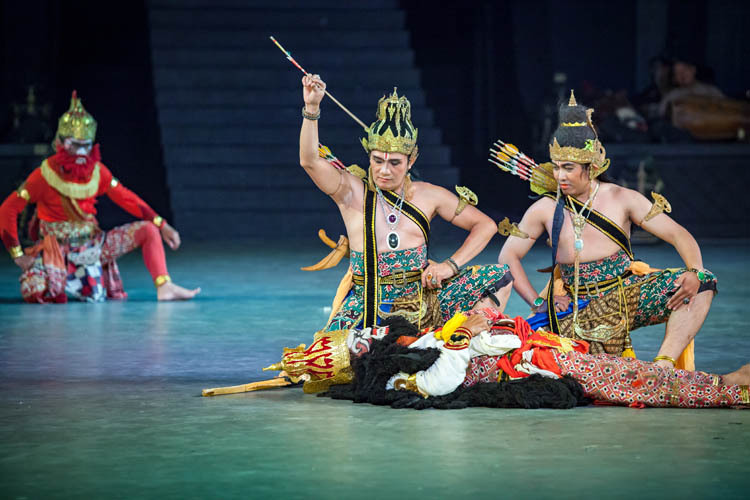 Rama and Laksmana join in the battle, and proceed to defeat Rawana’s generals one by one. Rama and Rawana do battle in the inevitable climax. Guess who wins? In victory, Rama is overcome by nasty jealousy, and questions Sita’s chastity while she was in Langka. How he could imagine that she could succumb to Rawana’s advances is beyond me. She agrees to undergo an ordeal by fire to prove herself to the undeserving Rama. Of course, she comes out of the test unscathed and smelling like roses (though maybe a little smoky). Rama is restored to his rightful position as King of Ayodhya, Good has triumphed over Evil, and order is restored to the universe. 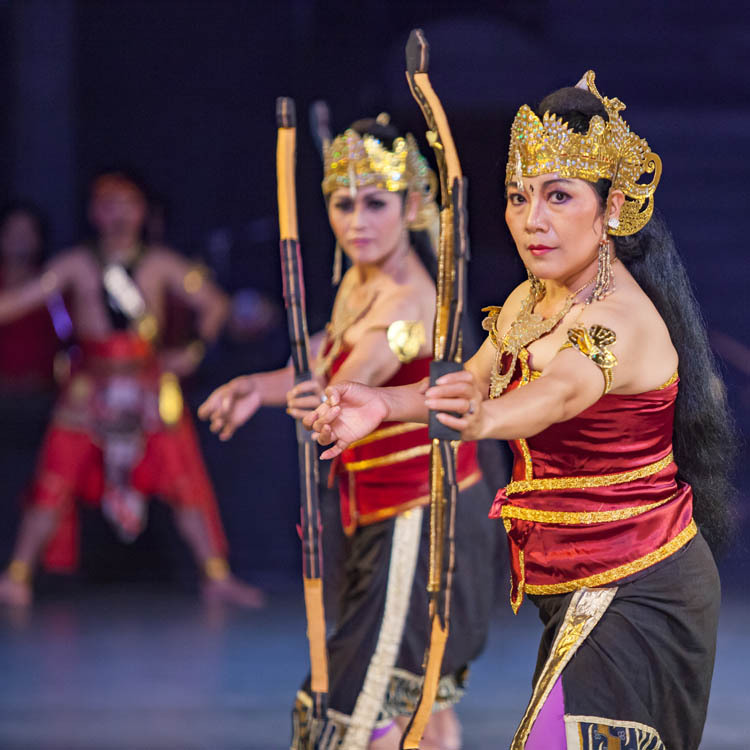 More photos from the Ramayana Ballet can be viewed on my website. 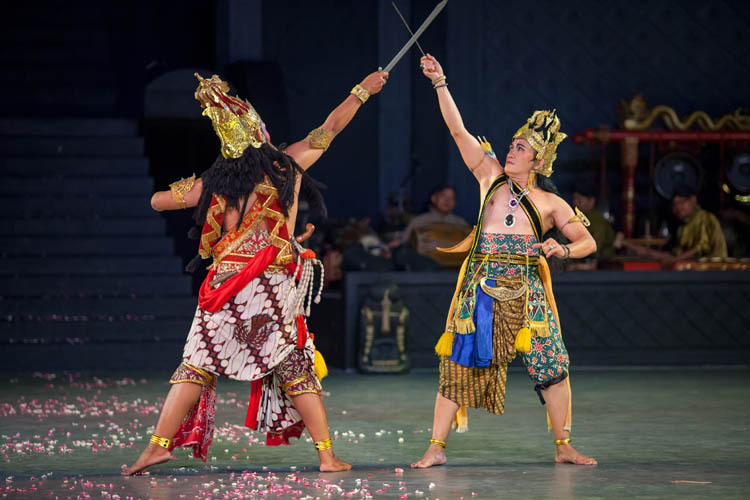 This entry was posted in Indonesia and tagged Jogjakarta, Laksmana, Prambanan, Rama, Ramayana Ballet, Rawana, Sita. Bookmark the permalink. Excellent photos. If you have any more from the current (2018) cast of performers I would love to see them. I took photos when I was there in May but they are not as good as yours ( phone camera 🙂 ). Sorry, Henry. 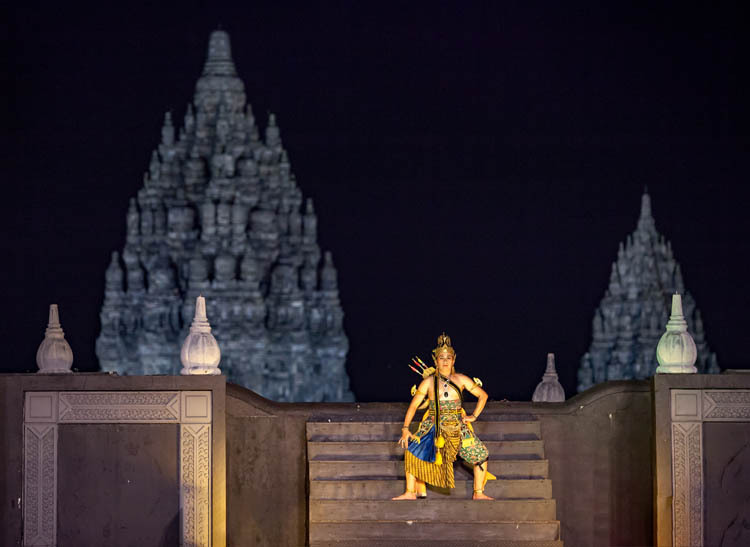 I was in Jogja for most of March, but sadly did not make it back to the Ramayana Ballet at Prambanan.